The other weekend I went to the U.S to go shopping with two girlfriends. Among several great deals, including my new Kate Spade wallet and Joe's Jeans I picked up some Lindt chocolate balls at their outlet store. I didn't pick up just any Lindt balls, I picked up white chocolate, coffee and most important of all, peanut butter. Oh, these are delicious. I know it is difficult for a peanut butter chocolate treat to compete with Reese's peanut butter cups but these are pretty darn close. I baked some cupcakes a few weeks back for my friend Vanessa and her family for a birthday gathering and I put some dark chocolate Lindt balls into the cupcakes. It was a hidden chocolate surprise. I wanted to repeat this delicious idea with the peanut butter balls. At the same time this idea popped into my head I also happen to be craving banana cupcakes. What's a girl to do other than put it all together? Can I even tell you how much as I was looking forward to making these? Not in words...read on, then bake on. These will make you happy. 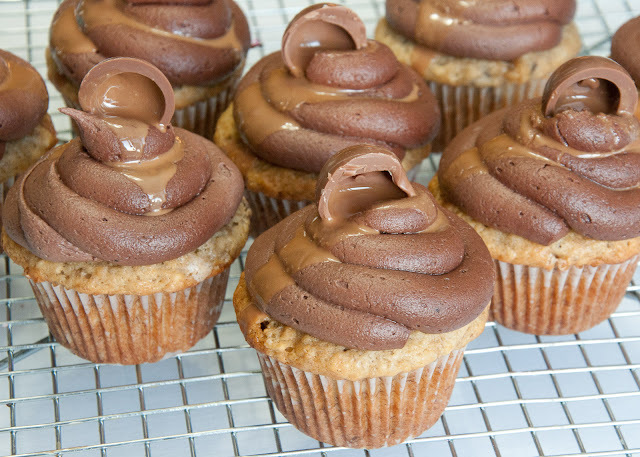 Banana Cupcakes with a Peanut Butter center and a Chocolate Peanut Butter icing. 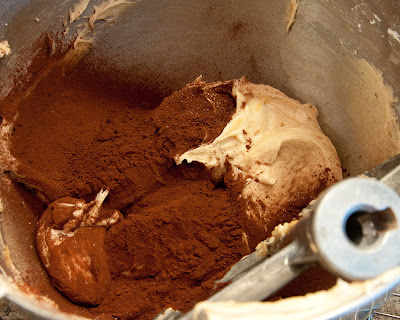 1-/4 - 1/2 cup cocoa powder - Start with 1/4 cup and add if you want it stronger. 1) Preheat oven to 350F. Line a 12 cupcake pan with liners. 2) In a medium bowl, sift together the flour, baking powder, baking soda and salt. 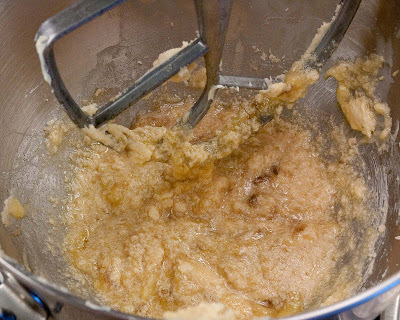 3) In a large bowl/mixer bowl beat the butter until smooth and creamy. Add the sugar and vanilla and beat until combined and fluffy. 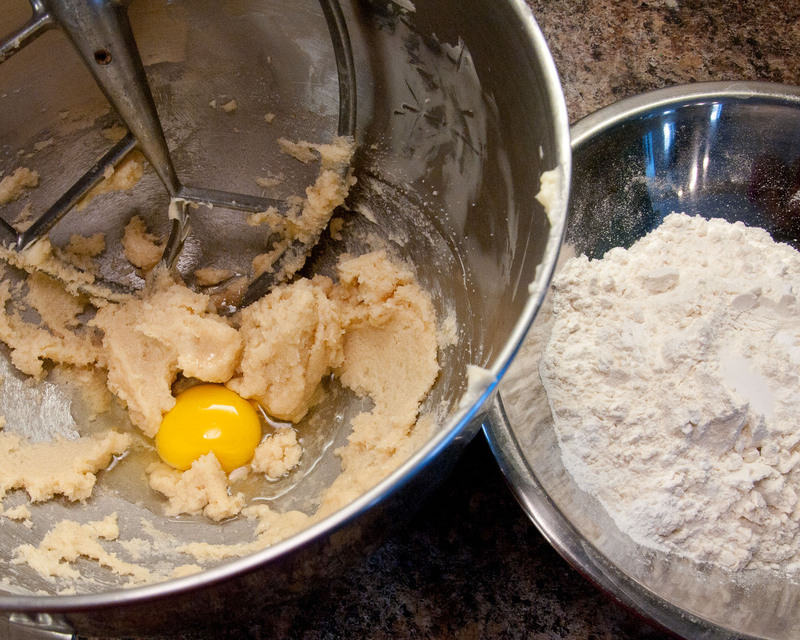 Add the eggs and scrape down the sides of the bowl as needed. 4) Add the bananas and beat until just combined. 5) Add the flour and buttermilk - alternating three flours-two buttermilk. Scrape down the bowl to ensure all incorporated. 6) Using a 1/4 cup scoop fill the liners about 2-3 full. 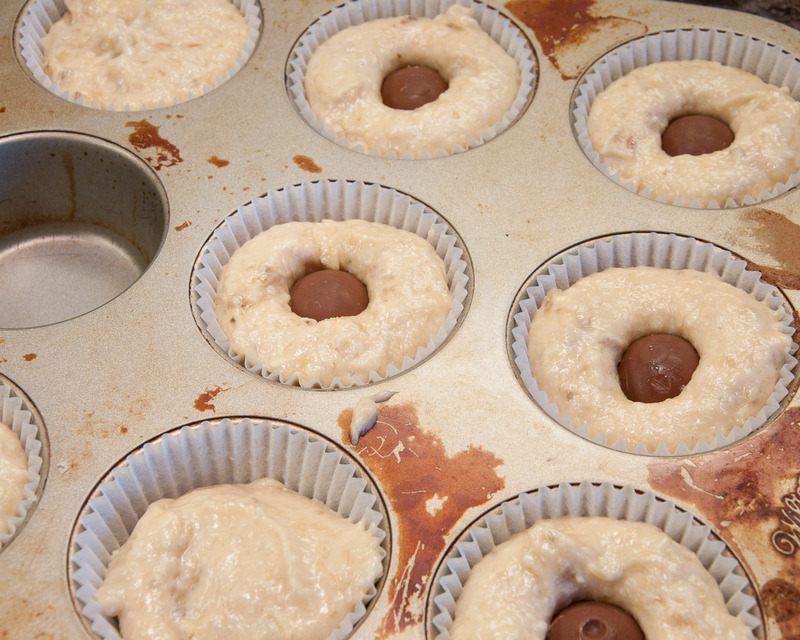 Add a Lindt ball to the center of each cupcake, pressing it into the cupcake. 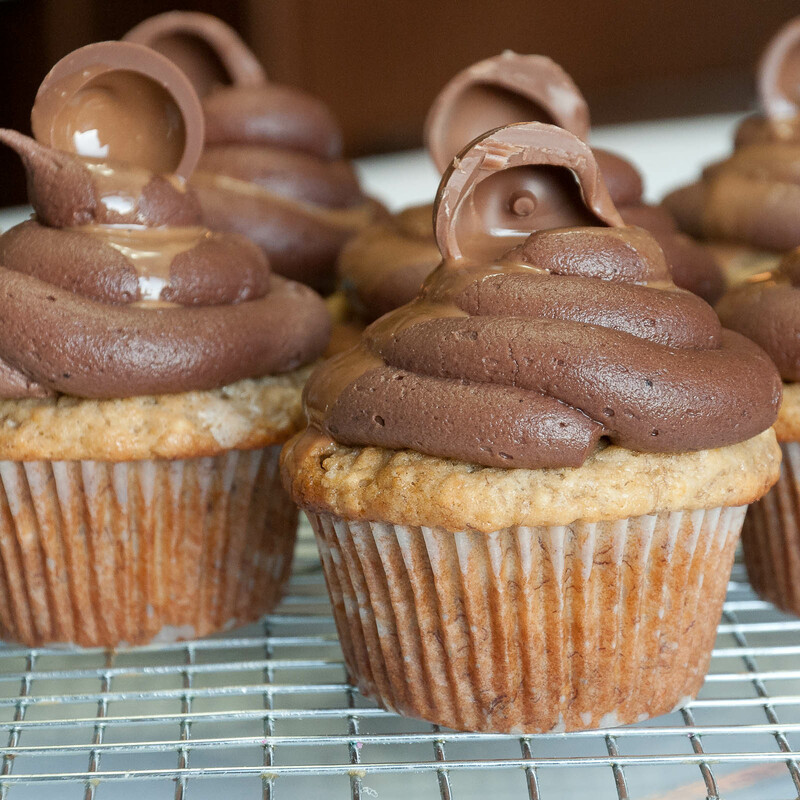 Using a small spoon or spatula, spread some cupcake batter over the chocolate. 7) Bake for 20 minutes, rotating the pans half way through. A toothpick will come out clean when done. Let cool in pan for 10 minutes in pan and remove to cool on wire rack. 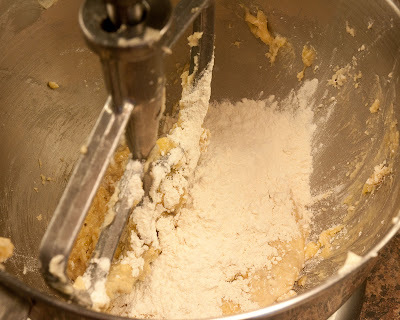 8) Make the icing : In a large bowl/mixer bowl beat butter and cream cheese until smooth. Add peanut butter beating until just combined. Add vanilla, confectioners sugar and cocoa powder in 2 parts, beating until combined. Icing will be fluffy and smooth. 9) Add icing to piping bag and swirl on to cupcakes. There was a reason I was so excited to make these. They were AWESOME! The combination of banana, chocolate and peanut butter is classic and fantastic. 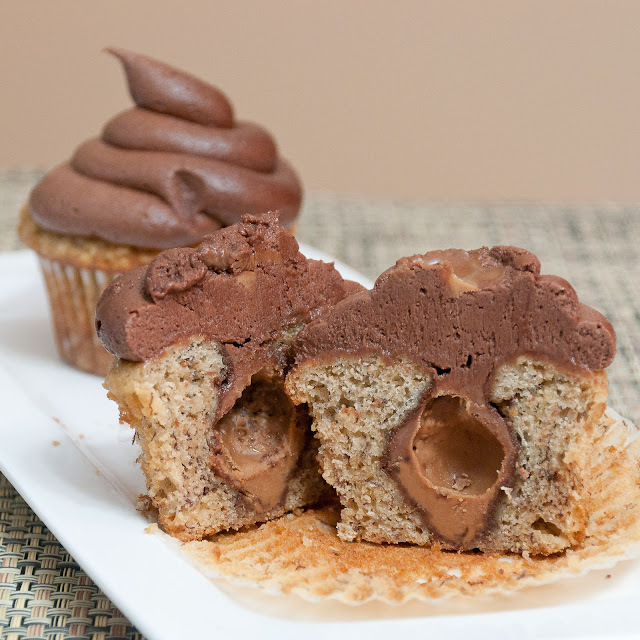 The cupcake is fluffy and moist, with a sweet peanut butter cream cheese icing and a secret creamy peanut butter center. Love it all. Ooohhh my!!! I'm suffering! They look so good Meg! Thank you for sharing and thank you for the preparation photos.. I am pretty sure that these cupcakes have to taste great. They look so yummy. Definetely, I will try to make them anytime soon. How much cocoa powder do you put in the frosting? Ooops - didn't notice that was missing. I made a comment I would start with 1/4 cup up to 1/2 cup depending on the chocolate intensity you want. Thanks so much! I took these to a party Saturday and everyone loved them. 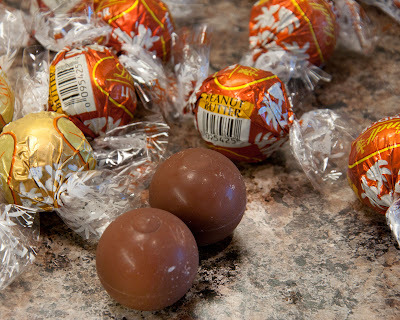 I couldn't find PB Lindts, so I had to use Dove Promises instead, but they were still great. I also garnished with a banana chip on top. These look delicious Meg! Love the combination of banana and peanut butter!